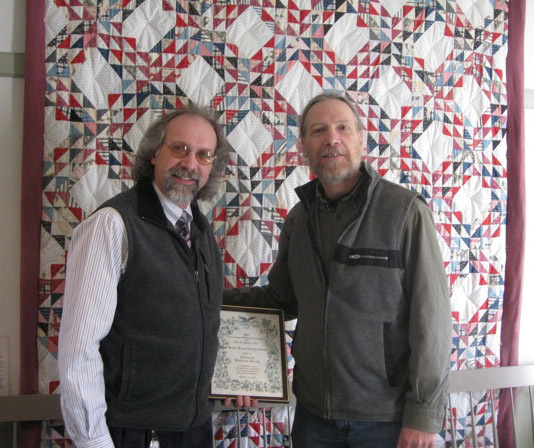 The Claremont NH Historical Society was selected by The Association of Historical Societies of New Hampshire as the recipient of the AHSNH Award for Local History in the Public Education Category. This is the first year of the award program to recognize organizations and individuals seeking to preserve, interpret, and promote appreciation and understanding of an aspect of New Hampshire history. The Public Education Award recognizes the quality and effectiveness of CHS's public programs, including their Cemetery Walks and Living History programs, and the Society's generous and significant mentoring of other organizations through their hands-on workshops. CHS President Colin Sanborn accepting the award from Tom Haynes in New London on Saturday Oct. 17, 2009. Past Claremont NH Historical Society Newsletters- click the link to view a pdf version.